Erin Turner, a current metalsmithing & jewelry graduate student at the University of North Texas, has been using laser cutting and etching in a variety of ways in her studio work. When she noticed significant variations in the quality of the etching on different enamels, she began an in-depth testing of them to determine why. 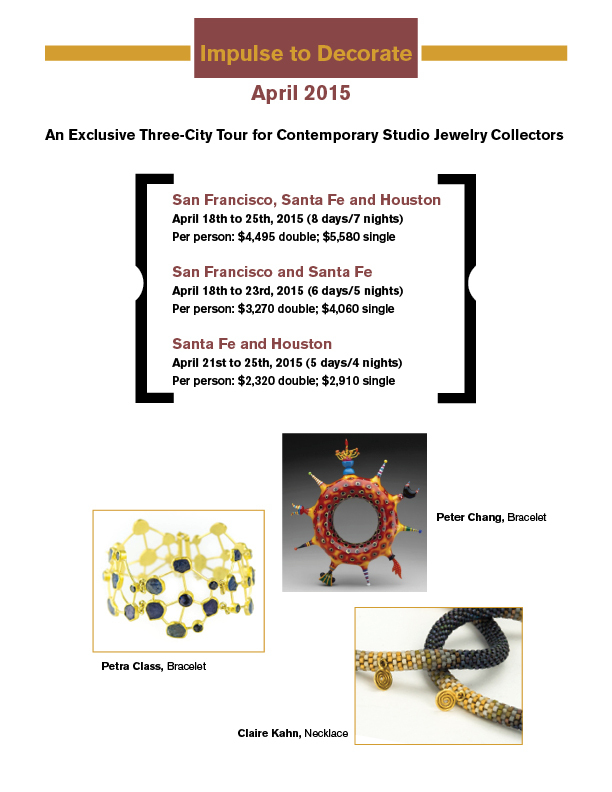 Don’t miss this exclusive three-city tour for contemporary studio jewelry collectors! Visit San Francisco, Santa Fe, and Houston this April to see some of the best collections and studios of art jewelry in the country. Includes the studios of several SNAG members. SNAG is thrilled to announce a new experience called SNAGneXt! It is a new way to get together, learn and broaden our horizons. Starting in 2016, SNAG will be hosting our first SNAGneXt, which will be held in Asheville, NC from May 19-21, 2016. Congratulations to J. Cotter Gallery for celebrating its 45th anniversary this year. It has been in the same location in Vail, CO and has had the same owner since it was established in 1970. It was the first jewelry and art gallery to be opened in Vail Village. Read about this and more news from the field in this week’s post.